Suppression of unwanted electromagnetic fields and electrostatic interference is essential on all aircraft. In communication radios, this is noticeable as audible noise. In other components, the effects may not be audible but pose a threat to proper operation. Large discharges of static electricity can permanently damage the sensitive solid-state microelectronics found in nearly all modern avionics. Many components of an aircraft are possible sources of electrical interference which can deteriorate the performance and reliability of avionics components. Rotating electrical devices, switching devices, ignition systems, propeller control systems, AC power lines, and voltage regulators all produce potential damaging fields. Shielding wires to electric components and ignition systems dissipates radio frequency noise energy. Instead of radiating into space, the braided conductive shielding guides unwanted current flows to ground. To prevent the build-up of electrical potential, all electrical components should also be bonded to the aircraft structure (ground). Isolation is another practical method of radio frequency suppression to prevent interference. This involves separating the source of the noise from the input circuits of the affected equipment. In some cases, noise in a receiver may be entirely eliminated simply by moving the antenna lead-in wire just a few inches away from a noise source. On other occasions, when shielding and isolation are not effective, a filter may need to be installed in the input circuit of an affected component. The aircraft surface can become highly charged with static electricity while in flight. Measures are required to eliminate the build-up and radiation of unwanted electrical charges. One of the most important measures taken to eliminate unwanted electrical charges which may damage or interfere with avionics equipment is bonding. Charges flowing in paths of variable resistance due to such causes as intermittent contact from vibration or the movement of a control surface produce electrical disturbances (noise) in avionics. Bonding provides the necessary electric connection between metallic parts of an aircraft to prevent variable resistance in the airframe. It provides a low-impedance ground return which minimizes interference from static electricity charges. All metal parts of the aircraft should be bonded to prevent the development of electrical potential build-up. Bonding also provides the low resistance return path for single wire electrical systems. Bonding jumpers and clamps are examples of bonding connectors. Jumpers should be as short as possible. Be sure finishes are removed in the contact area of a bonding device so that metal-to-metal contact exists. Resistance should not exceed .003 ohm. When a jumper is used only to reduce radio frequency noise and is not for current carrying purposes, a resistance of 0.01 ohm is satisfactory. 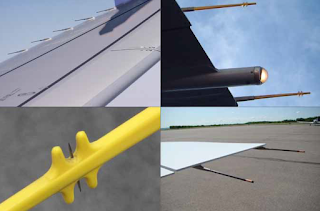 Static dischargers, or wicks, are installed on aircraft to reduce radio receiver interference. This interference is caused by corona discharge emitted from the aircraft as a result of precipitation static. Corona occurs in short pulses which produce noise at the radio frequency spectrum. Static dischargers are normally mounted on the trailing edges of the control surfaces, wing tips and the vertical stabilizer. They discharge precipitation static at points a critical distance away from avionics antennas where there is little or no coupling of the static to cause interference or noise. Flexible and semi-flexible dischargers are attached to the aircraft structure by metal screws, rivets, or epoxy. The connections should be checked periodically for security. A resistance measurement from the mount to the airframe should not exceed 0.1 ohm. Inspect the condition of all static dischargers in accordance with manufacturer’s instructions. Figure illustrates examples of static dischargers.